National joint-stock company Naftogaz Ukrainy in March bought natural gas in the European Union at $226 per 1,000 cubic meters, which is 6-13% cheaper than the price declared by Viktor Medvedchuk ($240-260 per 1,000 cubic meters) that could be offered by Gazprom under a contract with Ukraine. "Medvedchuk said about gas supplies at a price of $240-260 per 1,000 cubic meters. We bought at an open auction in the EU in March at an average price of $226 per 1,000 cubic meters. And in April, the price dropped to about $217 per 1,000 cubic meters," Naftogaz said on its Facebook page. Naftogaz also said that under the current contract, amended in the tribunal, Gazprom must sell gas to Ukraine at a price 48% cheaper than the price that would have been obtained in March using the formula in the original contract. At the same time, the Russian company refuses to comply with the arbitration award. As reported, Naftogaz of Ukraine has not been buying natural gas under a contract with Russia's PJSC Gazprom for 1,000 days, since November 26, 2015, importing gas from the West. Inconsistent prices were behind Ukraine's refusal to buy gas on its eastern border at the end of 2015. Late in December 2017, the Arbitration Institute of the Stockholm Chamber of Commerce revised the contractual formula in a contract between Naftogaz and Gazprom. By arbitration decision, the price of gas for Naftogaz shall be equal to the price of gas in the hub in Germany, whereas previously it depended on the price of gas oil and fuel oil. However, on March 1, 2018, Gazprom refused to resume gas supplies to Ukraine, having returned $127.624 million paid by Naftogaz in advance. 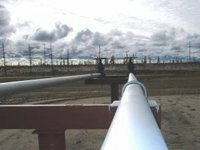 Gazprom thus violated the Stockholm Arbitration ruling, which adjusted the pricing under the contract between the two companies. Gazprom Board Chairman Alexei Miller during the talks with Medvedchuk and Yuriy Boiko with participation of Russian Prime Minister Dmitry Medvedev on Friday said that if Naftogaz restores direct purchases of gas from Gazprom the price for end consumer in Ukraine will be something like a quarter less than current prices.